Severe winters bring extra challenges to association maintenance, including the risk of ice dams. Ice dams form when snow accumulates on a roof, melts and freezes, usually at the base of a roof. As more snow melts, it is prevented by the dam from running off the roof. This water instead seeps into the house, wetting insulation and damaging ceilings, walls and more. Ice dams are more common on pitched asphalt roofs. These roofs were not designed to prevent infiltration from standing water. A heated attic area can cause snow and ice to build up on the unheated roof eaves outside, forming an ice dam. Heat can accumulate in attic areas and adjacent roof eaves when there is improper insulation or insufficient ventilation that allows warm and often humid air to escape from or around vent pipes penetrating the attic space. 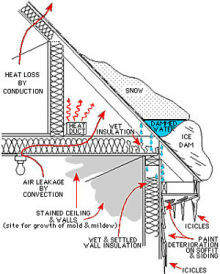 The best way to prevent ice dams and curtail water infiltration is to decrease the heat in the attic space. The cooler the attic, the less melt off occurs. Once ice dams have formed, the root cause should be thoroughly investigated, documented and corrected to prevent future ice dams from occurring. Shoveling the roof eaves can minimize the risk of ice dams until the root cause can be addressed. On one-story rambler-style townhomes, roof rakes can sometimes be used to clean the roof eaves, but isn't possible with the majority of taller townhomes. Roof rakes can also often cause damage to the shingles. The task of removing snow and ice from the roof eaves is best left to the snow removal contractor, as there is too much liability exposure for the association to handle this task internally with the use of association volunteers. Image courtesy of University of Minnesota Extension, Ice Dams publication. All rights reserved. An association's master policy is of no help when it comes to addressing the root cause or removing the ice dams, as both are considered maintenance items for the association. In fact, an association's master policy property section only becomes involved after the water has penetrated the roof and damaged the interior of the building in excess of the master policy deductible. At this point, the lives of the association 's residents have been disrupted, so it is in everyone's best interest to address the ice dams before the water enters the building's interior. Some association boards elect insurance coverage with very large property deductibles. In these cases, their property policy is going to be of little or no value in repairing the water damage. Clear ice and snow off the roof areas where water is seeping in. This is important to do promptly, as minimizing damage is a key insuring agreement provision. Immediately have the interior thoroughly dried by a competent water mitigation specialist. Postponing this step could also jeopardize coverage as prompt action minimizes damage. Promptly notify both the association and the individual unit owner's insurance carriers. Ice dams and the subsequent water damage often affect multiple units and it is advantageous to group these claims together. Assign a point person to coordinate the claim and communicate with the unit owners. It is not in the associations best interest to file multiple losses over a prolonged period of time as that will cause multiple property deductibles to be assessed. These steps only offer a general instruction on how to deal with ice dams on asphalt shingled roofs. Specific claim handling procedures need to be directed by the association's master policy insurance claims adjuster. Associations should take steps to prevent ice dams from occurring by providing adequate insulation and ventilation in the attic space, removing snow accumulation from roofs and continually monitoring the attic area for leaks. Contact a remediation specialist to start the dry-out process and assess scope of damage. Report the claim promptly, and include known affected addresses. Create a spreadsheet to track addresses of affected units. Communicate with all unit owners via announcements posted in common areas, e-mail blasts, and/or letters to advise them to look for damage in their units and report any damage to the property manager as soon as possible. Schedule inspection of units with remediation specialist together with the independent adjuster. Post the notice of inspection schedule for unit owners. Set a reminder for yourself to send the insurance adjuster new affected unit addresses no later than 10 days after the original claim submission.